Democrat Chris Pappas celebrates winning New Hampshire's 1st Congressional District race at an election party Tuesday in Manchester, New Hampshire. 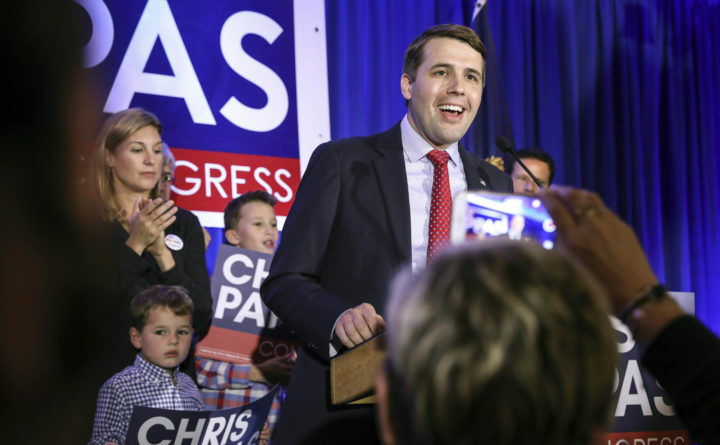 CONCORD, New Hampshire — New Hampshire will have its first openly gay member of Congress, after Democrat Chris Pappas beat back a challenge Tuesday from Republican Eddie Edwards. “When I went to Congress, I promised a new approach and that’s what we’ve done — bringing people together, Republicans, Democrats, independents to solve complex problems,” she said. Kuster said she plans to fight Republican proposals to cut Social Security and Medicare and would continue to advocate for women, including sexual assault victims.